Amaro’s father, a utility infielder who spent most of his career with the Phillies, married Judy Herman, an Ashkenazi Jew of Russian descent. Their son, Ruben Jr., was raised in the Philadelphia area. He attended Stanford University and played on the 1987 team that won the College World Series. 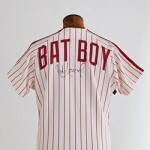 Amaro served as batboy for the Phillies in the early 1980’s and later played for the team. He and his father remain the only father-son combination to play for the Phillies. At the conclusion of his playing days, Ruben Jr. joined the Phillies front office. He served as Assistant General Manager for ten years and was promoted to General Manager one day after the Phillies celebrated their 2008 World Series championship. Amaro celebrated Jewish holidays in his youth and has been inducted into the Philadelphia Jewish Sports Hall Of Fame.